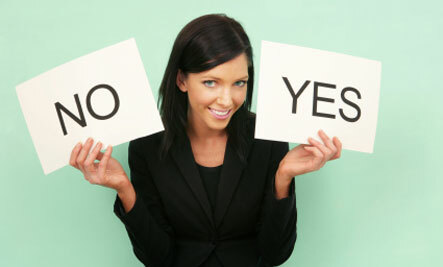 There are ways to break the habit of saying yes and get your life back, without giving up your career goals. If only the former first lady were around today to speak with today’s working professionals about just saying no at work. In addition to steering them away from drugs, she could also advise them to steer clear of taking on extra work, which (not unlike drugs) can so often take a toll on workers’ stress levels and productivity. Despite their already full workloads, tight deadlines and packed schedules, many working professionals have a hard time saying no, for fear of missing out on opportunities and damaging their professional image. Contrary to popular belief, however, saying no doesn’t have to be a bad thing. In fact, it can be incredibly empowering, says Scott Fetters, founder of High Five Digital Marketing. “Saying no is your battle shield for deflecting distractions, staying true to yourself and sticking to the course,”Fetters writes. Not to mention that it’s also one’s right to say no. Saying no, however, does not come easy -- especially in the workplace.Women in particular have a hard time saying no -- perhaps due to a learned habit of trying to please everyone or an inherent fear of hurting other people’s feelings. Fortunately, there are ways to break the habit of saying yes and get your life back, without giving up your career goals. 1. Shift your mindset. Don’t think of saying no as giving up or giving in. Look at it as a way to free up time for what’s truly important to you. “Some of us have a hard time saying no because we hate to miss an opportunity,”says HBR’s Peter Bregman. But saying no isn’t about missing an opportunity -- it’s about making a choice and opening yourself up to a different opportunity. 2. Take pride in saying no. Many people hesitate to say no for fear of losing respect from colleagues or their manager, when in reality, saying no can have the opposite effect. Saying no “shows you have a vision, a plan and an opinion,” Fetters says. 3. Be clear. One of the reasons women hate to say no is fear of hurting someone else’s feelings. But when you say no, you’re not rejecting that person -- just the request. So be clear and explain -- honestly -- why you’re rejecting the request. 4. Don’t feel guilty. Remember: You have a right to say no. Don’t feel guilty for saying no. After all, if you say yes to work and you don’t have the time, resources or energy needed to produce a quality result, isn’t that more unfair to the person whose request you’re accepting than saying no?